The initial plan was for an altar dedicated to the church’s name saint with a panel representing one of the miracles of Agnes. Work progressed under a commission issued to Alessandro Algardi. Following his death (1654) the project was entrusted to Ercole Ferrata and Domenico Guidi, still adhering to the original plans. 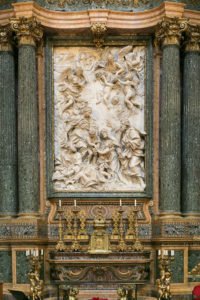 However in 1673, Domenico Guidi was issued a commission for a new subject, resulting in the white marble altarpiece as we now see it, officially unveiled on 13 July 1688. The high relief work shows the Holy Family with Saint Elizabeth, Saints John and Zacharia, in a scene of great vivacity and convincing compactness. The works for construction of the main altar of Sant’Agnese in Agone began in 1720, following plans prepared by Carlo Rainaldi but later revised by Ciro Ferri. The altar facade is composed of four columns in green antico marble, supporting a tympanum surmounted by angels. Between the angels we see the dove bearing a palm branch ‒ the symbol of martyrdom. The execution of the Greek-cross floorplan results in an octagonal central mass, with the main arms of the cross terminating in the entrance, the apse, and two lateral chapels. On the remaining sides of the octagon, diagonal to the arms, are four altar niches inserted between pairs of columns in Cottanello red marble. Within these are altars worked in precious marbles, surmounted by sculpted panels. Both the altarpieces and ceilings of the niches were executed according to an overall plan prepared in part by Alessandro Algardi. The altars were still incomplete when Algardi died in 1654, and the works were completed by his students, Ercole Ferrata and Domenico Guidi.